In the New York Film Academy’s most intensive workshop, this 6-Week Acting for Film Camp offers teens the chance to take the next step in developing their craft as actors. Offered in New York and Los Angeles, this summer camp is designed to challenge, inspire, and nurture students to develop their talent and skills while working collaboratively through hands-on experience crafting performances for the camera. The life-changing opportunity to learn acting from working industry professionals and in professional facilities or film studios is why many choose an acting camp with NYFA. 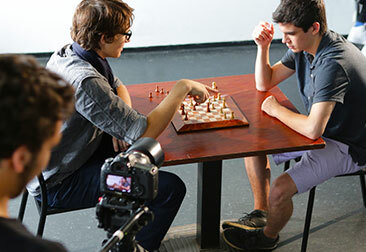 In addition to shooting scenes as a part of the Acting for Film class, acting students have the opportunity to audition for roles in film camp students’ films and receive experience acting on set. Naturally, there will be a final screening for cast, crew, family, and invited guests. Upon the successful completion of the 6-Week Acting for Film Camp, students will receive a New York Film Academy certificate and a copy of their work. Interested in learning more about the 6-Week Acting for Film Camp? Click here to learn more about the application process. Please note that curriculum, dates, and prices are open to change. Housing: Click here for availabilities.